LAS VEGAS—As we might have mentioned in a recent podcast, International CES is not exactly rife with blockbusters for Mac users. iPhone cases and mobile accessories and connected apps, sure, but most things aimed at the Mac are well out of the spotlight. Then again, if you know where to look on the show floor, you can find a few surprises. Take Other World Computing, which had a substantial booth in the Las Vegas Convention Center’s South Hall to promote its array of Mac upgrade products, along with some iOS cases and accessories of its own. If you’re lucky, though, the company will offer a sneak peek of something it has in the works—a numeric keypad add-on for Apple’s Wireless Keyboard. OWC tells me that it’s designed its numeric keypad with accountants in mind, with a layout that’s optimized for number crunching. 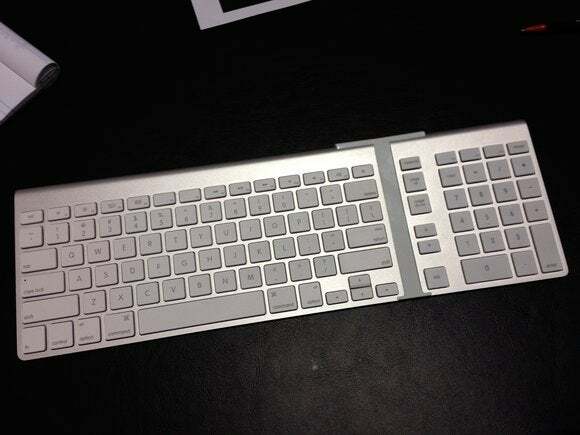 It won’t be the only option for Apple Wireless Keyboard owners—Belkin makes one as does LMP. But OWC thinks it can stand out from the crowd with its key layout and emphasis on design. From the photo at the top—the keypad add-on is attached to the right of Apple’s input device—it’s clear OWC is shooting for a look that matches Apple’s keyboard. Only if you get up close with the prototype and break out your calipers would you possibly notice that the key sizes are slightly different from the original, but again, this is a prototype—OWC expects to have a prefect when the first shipping units roll out of production. The keyboard add-on uses Bluetooth to connect wirelessly, with around a six-month battery life. When I flipped the numeric keypad over, I noticed some basic instructions on the backside—a troubleshooting cheat sheet that tells what the keypad’s colored status lights indicate. Look for a finished version of the numeric keypad to start shipping in a few weeks—in time to get started tallying up those tax returns.